Barbie has been many things over the years, but “robotics engineer” is probably the last career her creators expected for her when she debuted 59 years ago. Even G.I. Joe’s creators probably never imagined that the other half of the battle would be fought with robotic drones. Mattel’s Barbie brand introduced the Robotics Engineer Barbie this past week. She comes complete with a fashionable denim jacket (were denim jackets ever fashionable? ), a little plastic laptop, and a small silvery robot sidekick. For some reason, Robotics Engineer Barbie also comes with protective goggles, because it’s important to keep your eyes safe in case you put some bad code into your robot and it decides to kill all humans… or something like that, anyway. 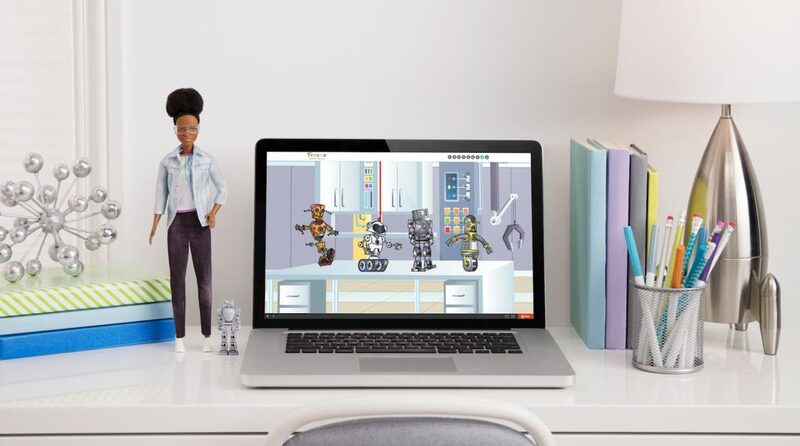 More importantly, Robotics Engineer Barbie extends the Barbie brand’s partnership with Tynker — a kid’s coding platform — and also launches simultaneously with Barbie’s new Code Camp for Barbie and Friends ebook and its new partnership with Black Girls CODE. This isn’t Barbie’s first coding career, as she’s had two previous computer science jobs, but it’s Mattel’s most comprehensive effort yet to promote and support women in STEM (Science, Technology, Engineering, and Math) careers. The press release announcing Robotics Engineer Barbie notes that women hold only 24 percent of STEM jobs. This is clearly an unbalanced ratio, and Mattel should be praised for its honest, earnest efforts to support girls who want to become programmers or engineers or scientists. However, I don’t believe that simply supporting young women is enough, and I’d imagine many women would agree with me. To fully encourage women to pursue technical careers, we must also address the widespread societal resistance to women in STEM. This starts with the men who dominate STEM professions, and the outlooks they bring to their industries. Consciously or not, the behavior of men throughout STEM industries has long resisted the inclusion of women in their workplaces, and that has to change. The #MeToo movement has exposed predatory behavior across STEM and STEM-adjacent industries, from the heart of Silicon Valley to Pixar’s GPU-driven animation studios. The #MeToo revelations show that the problem is not necessarily that girls don’t like to or want to code or discover new scientific breakthroughs — it’s that the men who’ve historically held power have behaved in ways that discourage women from viewing these as fields where they can build rewarding, fulfilling careers. Why should an intelligent, ambitious woman want to struggle against a tide of casual misogyny and barely-veiled resistance just to earn lesser benefits from greater talent and effort? Many women continue this struggle in spite of the obstacles placed in their way, and they should be celebrated for doing so. But many women have also realized that pushing that rock up the mountain day after day, only to have it knocked back down by men with outdated outlooks and toxic attitudes, will inevitably lead to stress, burnout, and dissatisfaction. A Bayer study from eight (!) years ago found that more than three-quarters of women and minorities weren’t encouraged to pursue STEM careers, even though the vast majority of people — men or women, minority or not — develop an interest in science and technology while still in grade school. That study focused on discouraging efforts at the college level. Subsequent studies found that gender bias can begin pushing girls away from STEM careers as early as grade school. Barbie’s efforts to teach girls to code are great. Programs, nonprofits, and apps that help girls learn about science and technology in a hands-on way are great. But they’re only part of the solution, and a smaller part at that. Girls who want to become robotics engineers, or software developers, or mathematicians, or scientists, should have every opportunity to do so. Giving them platforms to learn will help, but creating supportive environments in which they can progress will help far more. Next Article Next post: No. Robots will not replace humans.